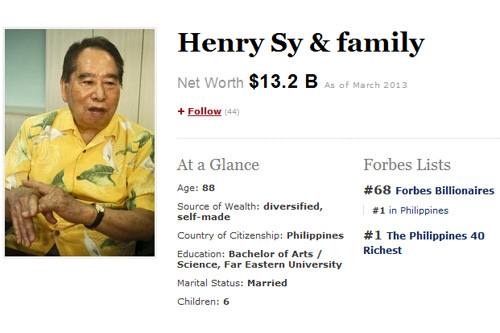 Henry Sy and his family top the list of Filipino billionaires and listed on ranked 68th, according to Forbes magazine's 2013 global billionaires' list. Henry Sy has net worth valued at $13.2 billion then followed by Lucio Tan with a net worth of $5 billion. Enrique Razon, Jr. ($4.9 billion), Andrew Tan ($3.95 billion), David Consunji and family ($2.8 billion), George Ty and family ($2.6 billion), Lucio and Susan Co ($2 billion), Robert Coyiuto, Jr. ($1.6 billion), Tony Tan Caktiong and family ($1.4 billion), Andrew Gotianun and family ($1.2 billion), and, Roberto Ongpin ($1.2 billion). Meanwhile, the top of Forbes billionaires list is Carlos Salim of Mexico with net worth valued at $73 billion, followed by Microsoft founder Bill Gates ($67 billion). For the meantime, if you like the info about No. 1 Filipino Billionaire, please bookmark this page and share it to your friends on Facebook, Twitter and Google+. Comments or suggestions about "Henry Sy No. 1 Filipino Billionaire" is important to us, you may share it by using the comment box below.